Both models shipped with 256 MB of RAM. Bluetooth, Airport Extreme, and a CD-RW/DVD+-RW drive were available as BTO options. Announced in January 2005 at MWSF, the Mac mini represented Apple's first real foray into the low-end consumer market, and Apple's first monitor-less consumer Mac in more than six years. Based around the basic motherboard design of the eMac (USB 2.0), the Mac mini packed an impressive feature set into a very small package, just two inches tall and 6.5 inches wide and deep. The rectangular case was reminiscent of the failed G4 Cube, the mistakes of which Apple seemed determined not to repeat with the mini. 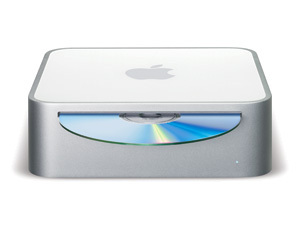 Whereas the Cube had been aimed at a high-end fetish market, the Mac mini was targeted specifically to PC owners, and was well-timed and well-positioned to increase Apple's marketshare. The Mac mini was an attempt to take advantage of the so-called "halo effect" that the iPod had created in the consumer space. The basic idea of the mini was simple: let current PC owners spend $500 to replace their PC, while continuing to use their existing monitor and USB peripherals. To this end, Apple made every effort to keep the cost of the mini low, while maintaining their best-in-the-industry profit margin. While Airport Extreme and Bluetooth were available as BTO options, they were not included in either stock configuration, nor were a keyboard or mouse. The mini also lacked a sound-input jack, a feature present in Apple's entire desktop lineup at the time. To keep the size small, Apple used a 2.5" laptop hard drive, and included a single RAM slot. The Mac mini shipped in two configurations. The low-end 1.25 GHz model, with a 40 GB hard drive, was $499, while the high-end 1.42 GHz model, with an 80 GB hard drive, was $599. Both models shipped with 256 MB of RAM. In July 2005, Apple upgraded all models to 512 MB of RAM. It also added AirPort Extreme and Bluetooth to, and removed the standard 56 kbps modem from, the high-end configuration. Finally, a higher-end model, which included a 4x SuperDrive, was made available for $699. In late September 2005, Apple silently upgraded middle and high-end models to a 1.5 GHz processor, adding a faster SuperDrive, a 5400 RPM hard drive, Bluetooth 2.0+EDR and an ATI Radeon 9200 with 64 MB of DDR SDRAM. All models were discontinued on the last day of February 2006, with the release of the intel-based Mac mini line.